This stunning polyester glitter is a home run especially when used outdoors! 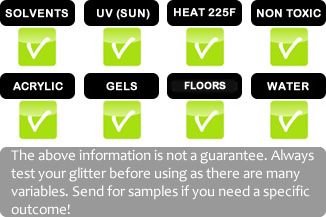 This Fine glitter is flake size 0.015. Polyester glitter works great with clear glue, high quality spray glues, in epoxy, and more. Note: This iridescent glitter changes color when the light hits it. It also shows off a different look based on the color below it (it is transparent). For a subtle effect put it over light backgrounds and for dramatic effect dark ones.